30th March >>10-2am>> Free Entry! Boca 45 is always ready to hit the clubs, armed with a heaving box of 7” vinyl. His aim? As it has been on all his global travels and international DJ shows, to whip crowds into a frenzy with his crazy collection of hot brand new 7'' donuts & vintage vinyl gems. 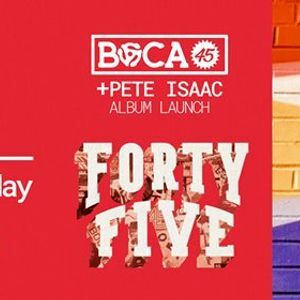 Bristol (UK) Native Boca 45 (Scott Hendy) immersed himself in all things Hip Hop from a young age and has been unleashing funky gemstone productions upon the world for years under his various guises. He formed Dynamo Productions with Portishead’s acclaimed resident Dj Andy Smith in the early 00’s & they found a new place musically, fusing the best elements of HipHop ,funk and beats. The duo quickly picked up a residency at Fabric live and found themselves taking their new sound across the globe. Collaboration has always been an important factor of Boca’s DNA and along the way further Collaborative projects continued to develop “The BeeKeepers” (with Parker) on Jalapeno Records, “BocaWoody” (with 2 time world champion DJ Woody), “Malachai” (with singer Gee) on Domino Records - which was named Zane Lowes hottest record of the week & gained HUGE critical acclaim across their 3 LPs. Boca 45 is also obviously a DJ of some renown having taken to the stage across the worlds clubs and festivals. Banksy personally requested him to Dj at the opening party for Dismal Land in 2015 and he can also include Serge from Kasabian, Geoff Barrow (Portishead), Huey Morgan & Craig Charles at BBC Radio 6 as part of his large group of fans. An Anthology of all things Boca spanning the many years he has been delivering the musical goods! The compilation was packed with classics, forgotten gems and also some new exclusive music in the form of the amazing ‘Hand Of God’and ‘The Bear Pit’ (a Collaboration with Bristol Funk outfit - Mohawkestra) which is named after an under pass in Scott’s native Bristol where men would actually fight with Bears as a form of entertainment! The LP was #1 in the Juno sales chart . Scott Boca also heads up the hugely successful 45Live movement with partner Pete Isaac which consolidates a crew of 45 Vinyl slingers such as Dj Format, DJ Food (Ninja), John More (Coldcut) & many more to host club nights & festival areas all over the Globe (Boardmasters, Masked Ball etc) where only 45 RPM singles are played. This year he’s also releasing his BocasClubDonuts series which is a 7’’/45 vinyl single every other month aimed squarely at the the Dance floor. BCD01 was released in Feb this year & quickly disappeared in under a week.. It also had countless plays on Radio Worldwide including BBC Radio 6 where “Fat Back Boys” was made single of the week..
Pete Isaac is best known as the DJ promoter behind the seminal southwest club-night Jelly Jazz since January 1993, which saw its 25th Anniversary in 2018, a major milestone for any club night. In its early days during the height of the southwest's rave culture, Jelly Jazz started out to provide a weekly diet of soul, funk, latin, hip hop and break-beat all with a jazz twist to them. The blend worked and the unpretentious, 'sweat dripping off the walls', 'dance till you drop' attitude and atmosphere driven relentlessly by the musical passion of resident DJ's Pete Isaac and Griff soon became a major force in Southwest club-culture. Fairly soon Jelly Jazz developed an international reputation and was attracting the likes of Gilles Peterson, Norman Jay, Mr. Scruff, Quantic, Patrick Forge, Chris Goss, Andy Smith, Russ Dewbury, Rainer Truby, Jazzanova, and DJ Format as guest DJs.